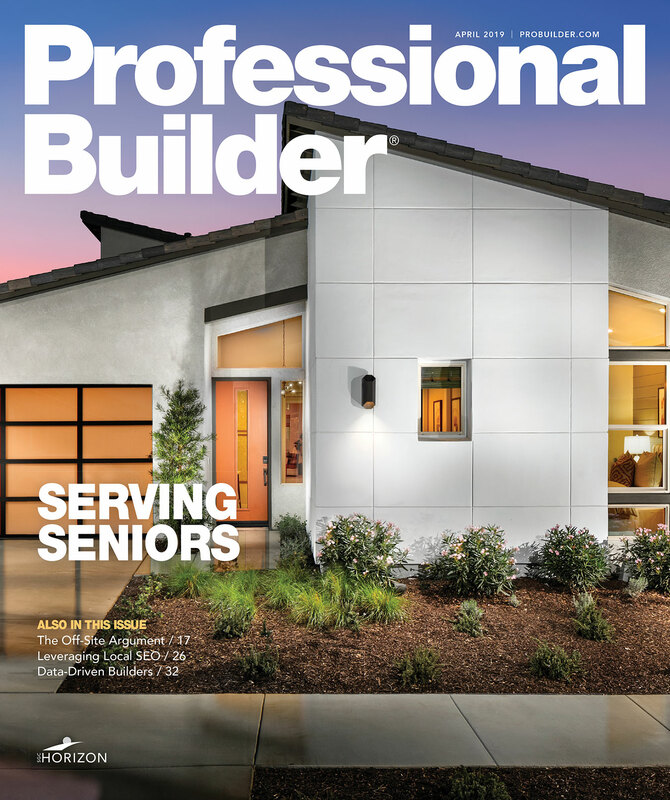 Thrive Home Builders’ top management. From left: Kevin Puccio, VP community development; Stephen Myers, chief operating officer; Gene Myers, founder and CEO; Bill Rectanus, VP home building operations; Jeff Seibold, CFO. 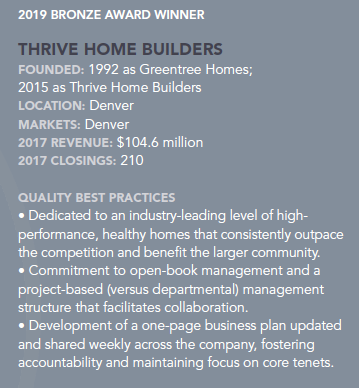 With profits down, standing inventory up, employee turnover high, cycle time dragging, and bonuses dissolving, the middle managers at Thrive Home Builders did the only logical thing they could to help right the ship: apply for an NHQ Award. If that seems odd, you don’t know Thrive. Continuous improvement may as well be this builder’s middle name. And with the benefit of an open-book, project-based management structure, the team with the clearest and most comprehensive view of both the field and the corner offices—those in the middle—sought insight from the NHQ judges to get better. 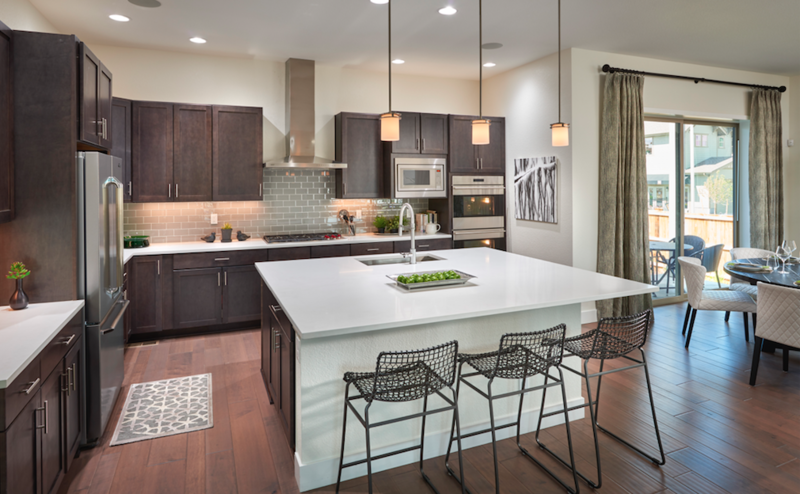 Homes in Thrive Home Builders' Panacea Collection, in the Beeler Park neighborhood of Stapleton, Colo., feature mid-century-modern–inspired architecture combined with energy-efficient construction and a focus on cleaner indoor air. In fact, despite wanting the judges’ feedback, Myers and his team of 70-plus employees weren’t waiting for the judges’ visit or their report to act. Several initiatives connected to the company’s tenets of becoming data-driven and reducing both scheduling and budget variances were already in the works, including a centralized scheduling system with trade partners, a comprehensive construction quality program (on top of what the judges’ deemed a strong quality-assurance infrastructure), and a new and improved customer relationship management app, among others. From those, the examiners left their on-site visit wanting more specifics regarding construction performance and the seeds of low customer satisfaction and referral sales, as well as measurable outcomes from several of the new systems and actions implemented following a LeanBuilding Blitz session by home building consultant True North Development. Every home built by Thrive is qualified under the EPA's Indoor airPLUS program. So far this year, Thrive is enjoying a strong rebound from a lackluster 2017. “We look like geniuses,” says Myers, tongue firmly in cheek in deference to the NHQ process. “We’re now reaping the rewards of those investments and a lot of hard work over the past 18 months.” And yet there’s no doubt Myers and his team will take the judges’ feedback to heart, especially regarding a better and more open relationship with trade partners, leveraging data more effectively, and providing assurances for employees, some of whom, still smarting from 2008, remain on the lookout for red flags. NHQ validated much of what the Thrive team already knew, while exposing areas for improvement. “We’re on a long-term journey that will never end,” Myers says. “Continuous improvement is not about an end goal; it’s the job."